This guide focuses on the Custom Report feature, which allows you to build your report chart by chart, for the most control and customization options. If you’re new to Checkbox or need to create a quicker summary report, we recommend taking a look at our Quick Report Guide. 1. Give your report a name. This will only be shown to you as the admin. Under Report Type, choose ‘Create a custom report’. 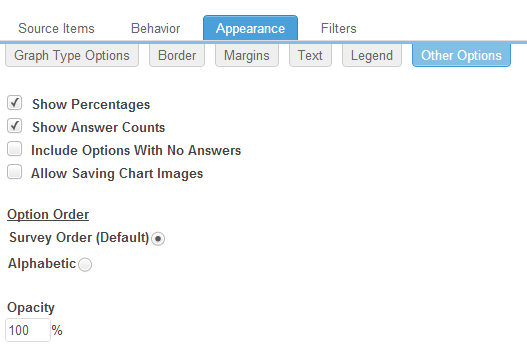 This will allow you to build your report from scratch, by choosing each graph or chart you need. 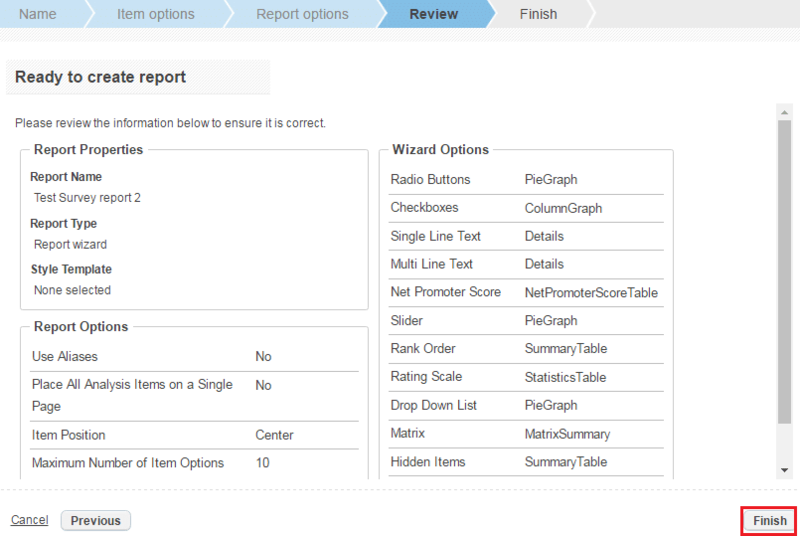 Because we are generating a report from scratch instead of using the automated “Report Wizard” option, we will skip over Item Options and Report Options and move right into the Review step. Click the Previous button to return the previous step. Click the Finish button to save your report settings and be brought into the report editor. The Report Editor layout is similar to the Survey Editor layout in that pages and items are listed on the left side of the window and items are edited and previewed on the right side of the window. From here you can add or make changes to report items. 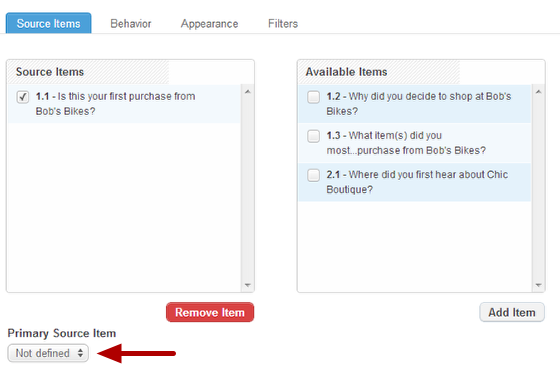 Add your first item to Page 1 by selecting +Item on the page bar. 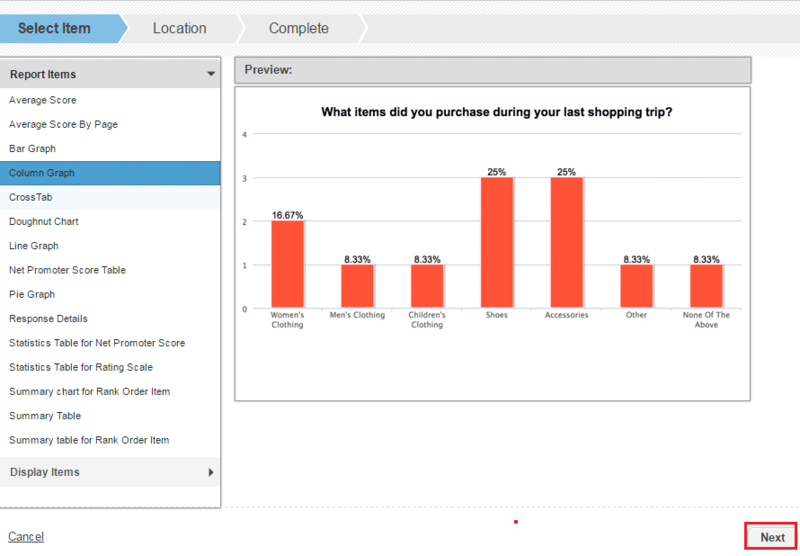 Select an item option from the Report Items menu or the Display Items menu. 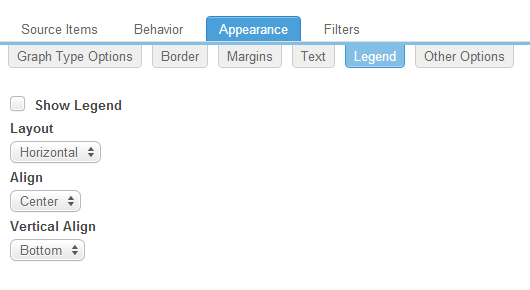 In this example, we added a Column Graph from the Report Items menu. 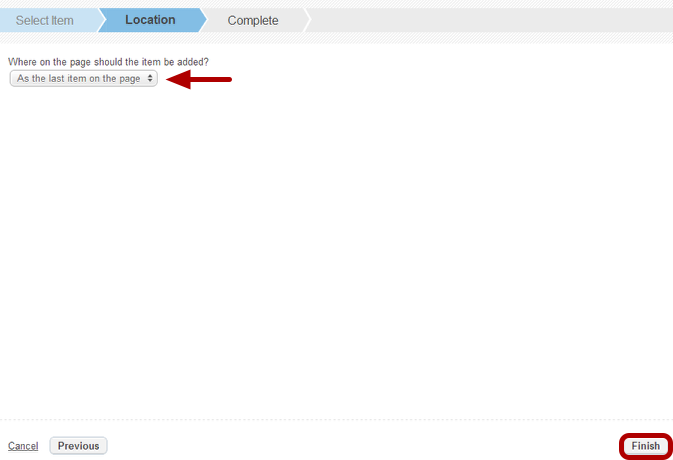 On the Location step, determine where you would like your item to be located on the page. Since this is the first item we are adding we will just leave the default location. 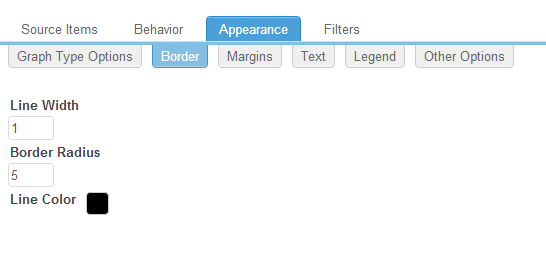 Configure your chart or graph by moving through each of the tabs in the report item editor, as described below. NOTE: You do not need to click “Save” until you are finished with all tabs. Source items are the questions from your survey that will be the data sources for your reports. Select one or more source items from the list of available items on the right and click Add Item to add it to your chart. 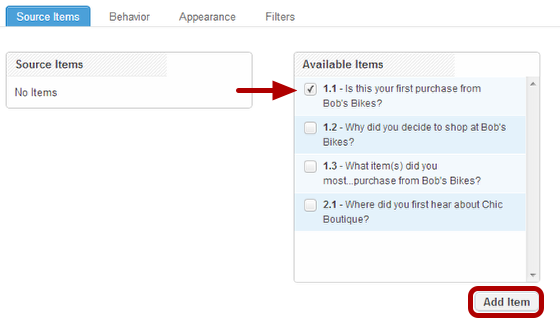 In this example, we selected item 1.1 (item 1 on page 1 of our survey) as the source item for our Column Graph. If you selected more than one source item, you can set one as the Primary Source Item from the drop-down at the bottom of the window. Use Aliases – If you created a question or answer text aliases in your survey, you can enable them here. Aliases act as alternate text and enabling them here will display your alias text in place of the original question or answer text. Display Answers Summary- Will display the answers for the item as well as, depending on the question type, number of times selected, percentage of total responses that selected the answer or the score for each answer. 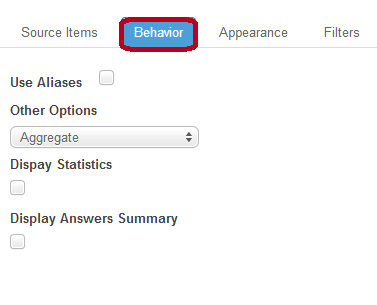 Select “Other” Options – If you enabled the “Other” option in the survey source item, allowing respondents to enter their own answer instead of selecting on of the ones you provided, you can determine how you want the “Other” answers to be displayed on your Summary Chart. 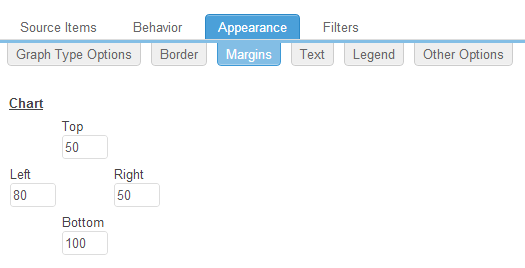 Under Margins you can adjust the space between the chart and the border. When you are finished customizing your report item, select Save to return to the Report Editor. From here you can add more pages and items to your report, or run it by clicking Run Report at the top of the left-hand panel. NOTE: The data displayed in the item preview is sample data. 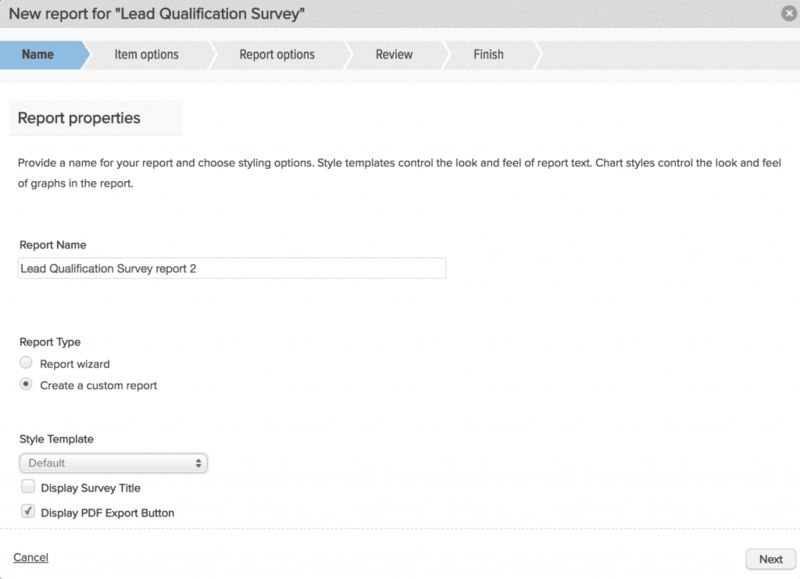 You must run your report to view actual live response data. 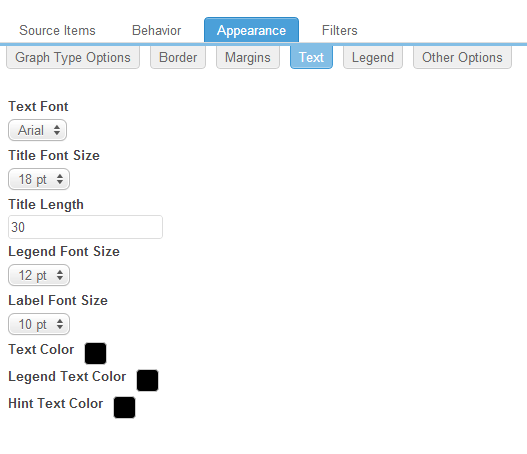 To edit an existing item, select it from the left-hand panel and use the editor tabs that expand on the right to make adjustments. Use the Item Actions menu at the top right-hand corner of the item editor to move, copy, or delete the item.